Advancing the current state of digital downloading for entertainment fans everywhere, Pioneer Electronics (USA) Inc. today introduces two DVD/CD computer writers featuring Qflix™ DVD Download & Burn technology, enabling users to download their favorite movies directly from the Internet to DVD. As personal computers become media centers for many consumers, the new Pioneer® internal DVR-2920Q and external DVR-X162Q DVD/CD writers allow users to take advantage of this exciting technology while expanding their entertainment collections with a tangible, familiar media that will maintain into the future. Jointly developed by Pioneer and Sonic Solutions®, Qflix is an emerging DVD technology that gives consumers the opportunity to purchase licensed Hollywood films, and eventually TV shows, from CinemaNow, some of which have previously been unavailable at retail. "Consumer adoption of digitally distributed entertainment will happen at a far greater rate than the extinction of the DVD player," aid Mark Ely, executive vice president of Strategy, Sonic Solutions. "Qflix is an important and necessary bridging technology that allows content owners to deliver a more flexible product that combines the convenience of digital distribution with the permanency and portability of the DVD." 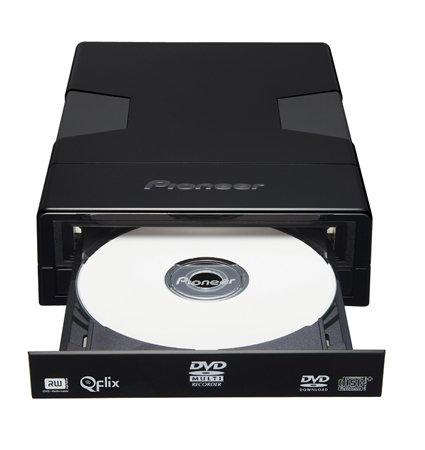 For home audiences who were previously relegated to viewing downloaded content on a small computer screen, Pioneer’s new writers with Qflix technology enables users to preserve digital content for playback on standard DVD players and then watch it on a big screen television. The result is a richer viewing experience that transcends current digital entertainment options. "Our commitment to enhancing the digital entertainment experience has driven us to expand offerings in new ways, far beyond the traditional computer screen. Now we can provide a packaged media option that can be enjoyed on multiple disc drives or players located throughout a home," said David Cook, president and COO of CinemaNow. "Being able to offer a selection of feature films that are compatible with Qflix technology, unlocks a dynamic collection of content for consumers who are searching for movies or shows that do not even exist on DVD." Streamlining the user experience, both Pioneer drives incorporate Roxio’s Venue™ software that provides simplified management and writing of downloaded digital content. Also included in the software bundle are applications that allow users to back-up and play their disc media on a PC via the Roxio CinePlayer® and Easy CD & DVD Burning software. Available at retail stores nationwide and at www.pioneerelectronics.com, the Pioneer internal DVR-2920Q and the external DVR-X162Q DVD/CD writers will begin shipping in October 2008 for a suggested price of $69.99 and November 2008 for a suggested price of $114.99, respectively. Pioneer has been an innovator of optical disc technology since it brought LaserDisc, the precursor to DVD, to market in 1980. Pioneer went on to introduce the first DVD writer for computer use in 1997, the first DVD recorder as a VCR replacement in 1999, the first DVD/CD writer for home computer users in 2001 and the first Blu-ray Disc writer in 2006. Pioneer Corporation is one of the Blu-ray Disc Founders. Pioneer’s Home Entertainment and Business Solutions Group develops high definition home theater equipment. Its flat panel televisions, Blu-ray Disc players, A/V receivers and speakers bring a new level of emotion to the HD experience. The company brands include Pioneer and Elite®. When purchased from an authorized retailer, consumers receive a limited warranty for one year with Pioneer products and two years with Pioneer Elite products. More details can be located at www.pioneerelectronics.com. The Qflix™ program offers a new means for content owners to release titles for custom production and sale over the Internet while maintaining the same level of copy protection used on commercially mass-produced DVDs. Sonic's Qflix program provides essential technology and IP for both the professional and consumer market. For professional and enterprise manufacturing of DVDs "on demand," the Qflix program allows production facilities to reduce the cost of carrying physical inventory while simultaneously offering extensive catalogs of content. The program also enables retailers to broaden the number of movies by augmenting physical product with on-demand DVD creation kiosks in their stores. For consumers, the Qflix program provides a long-awaited downloading and burning solution for movies and premium video content in computers and consumer electronic devices such as set-top boxes, networked DVD recorders, and DVRs. For more information regarding the Qflix technology licensing program, please contact Qflix Licensing (licensing@qflix.com) or visit (www.qflix.com).